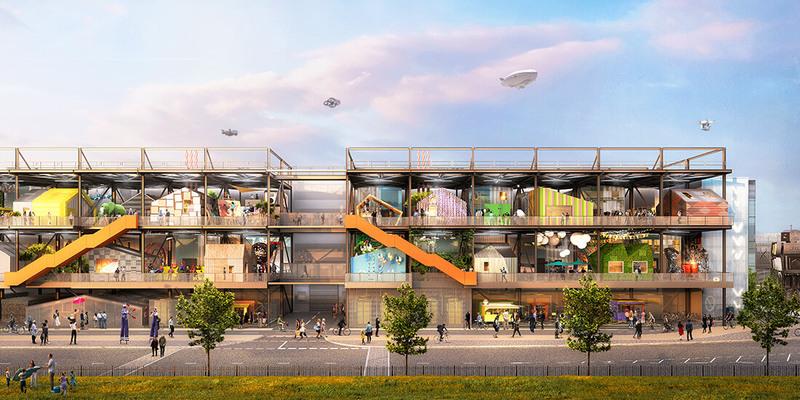 A concept illustration for The Trampery at the Gantry in East London, a former gantry transformed into a home for creative studios. Courtesy Hawkins\Brown. In East London, The Trampery on the Gantry is doubling down on the “creative” aspect of creative reuse. 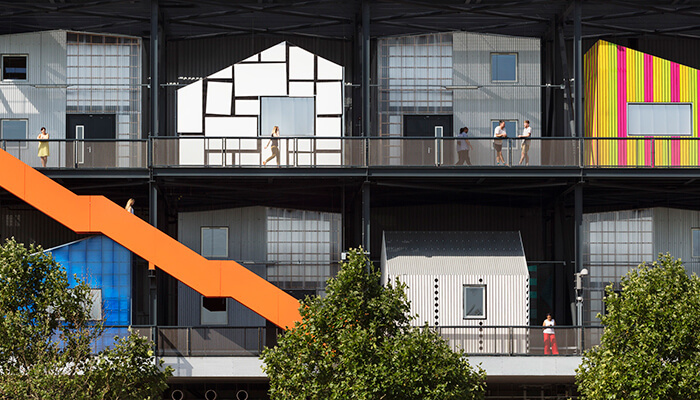 Part of the massive broadcast center used during the 2012 Olympic Games, the former HVAC gantry structure has been retrofitted by architecture firm Hawkins\Brown as an arts and media innovation hub. This idea became the conceptual framework for the project’s design: The gantry would become a Victorian “cabinet of curiosities,” which the firm modeled with collaged images of steam engines, an airplane, and an old-timey metronome. Images of a toy bird, a toy camera, an RV trailer, a Ferris wheel, and a red tin robot added exuberant juxtaposition. Studio facades display a sense of whimsy while paying homage to the neighborhood’s industrial history. Courtesy Rory Gardiner/Hawkins\Brown. This same sense of fun and experimentation is on display in the actual structure, which houses 21 studios for artists and creative businesses. 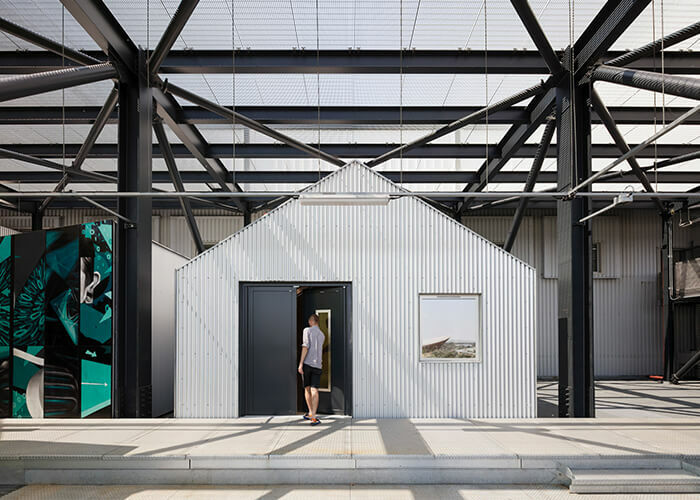 The steel structure is divided into 26-by-26-foot bays, one for each studio space, arranged in a checkerboard pattern to balance their weight in the cantilevered structure. Two-story studios at the rear offer more muted facades; one-story units in the front are more flamboyant, adorned in artificial grass and shimmering polycarbonate panels. Textures and geometries are postmodern and antic, inspired by the inside-out structural expression of the Centre Georges Pompidou museum in Paris, France. 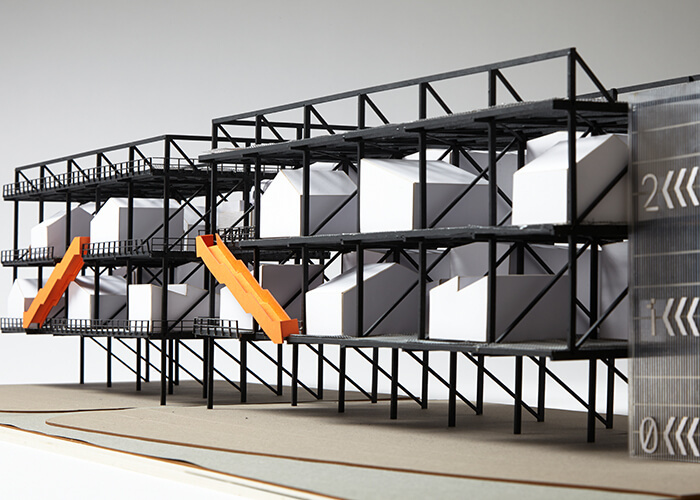 The gantry is located in a former industrial district called Hackney Wick now colonized by artists and creatives. The studio designs acknowledge the area’s history of making; each facade pays homage to the factories and workshops that kept this part of East London humming before industrial production was largely outsourced. The studios are offered at below-market rates, and 80 percent of units are offered to local creative businesses, says Cris Robertson of The Trampery, the social enterprise that will manage the “vertical village of sustainable studios.” Subsidies are through the government’s Section 106 agreement, which diverts money from developers working to get new projects built and invests it into community-focused projects such as public art or park spaces. The built “vertical village.” Courtesy Rory Gardiner/Hawkins\Brown. “At a time when less-traditional space is becoming available and rising rent is pushing out creatives, this demonstrates how innovative architectural techniques can bring previously unused spaces to life,” Robertson says. The studios’ building method is also critical to its modest fees and overall execution. These maker spaces were all built with the WikiHouse platform, which is a crowdsourced, free set of drawings, renderings, and details that show how to build a single-family-home-scaled structure without skilled labor or specialized tools beyond a CNC mill—all for only $48,000. 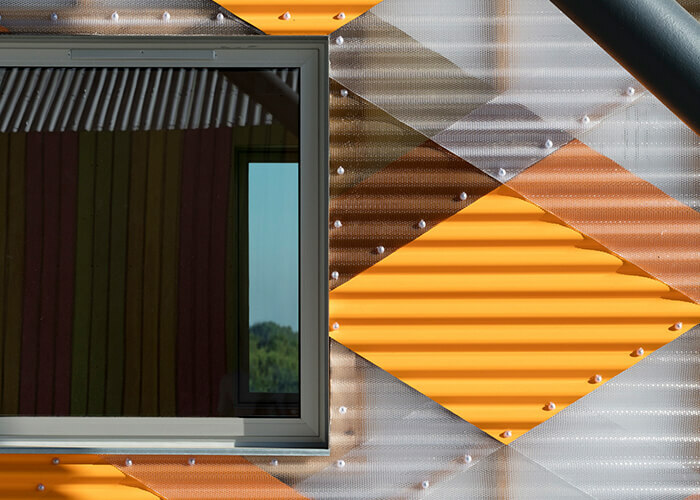 While WikiHouse currently offers one design template, the platform provides open-source building technologies—sort of like digital LEGOs—for architects, engineers, and self-builders to create their own designs. For The Trampery, following the WikiHouse plan, plywood sheets are cut into building components with a CNC mill and slotted together with a wedge-and-peg system as wafers fasten perpendicular panels together. Get the tool that helped transform a gantry into an artist’s paradise. 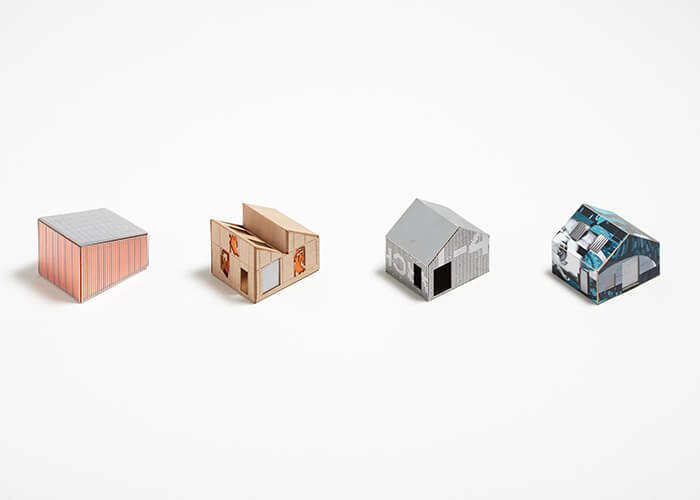 Studios are variations of a WikiHouse design. Courtesy Hawkins\Brown. An early model of the gantry structure. Courtesy Hawkins\Brown. Detail of a studio facade. Courtesy Rory Gardiner/Hawkins\Brown. One facade evokes salmon skin, scales, and flesh. Courtesy Rory Gardiner/Hawkins\Brown. But for now, “the whole system is geared around a domestic scale,” Hills says, which is why The Trampery on the Gantry embraces its spirited familiarity even when it’s surrounded by a high-tech innovation campus. WikiHouse is meant to be engaging, humble, and approachable—aesthetics reflected in the studios’ outward appearance. “Part of the concept of the ‘cabinet of curiosities’ was variety,” Hills says. He and his colleagues spent days manipulating the pitch of each roof in a physical model, moving and arranging patterns across the bays, looking for the most pleasing rhythm of shed roofs, symmetrical and unsymmetrical gables, and dual-pitched roofs. Similarly, The Trampery on the Gantry’s approach to creative place-making and artistic production is intensely managed and curated. Instead of setting up shop in the old Stratford Jute Mill (constructed in 1864), there’s space in a jute mill–themed studio with metal facade panels that mimic jute’s crosshatch texture. WikiHouse is working on new prototypes that will be entirely demountable and ready for disassembly, opening the door for new chapters of history at the gantry to cycle in and out, and allowing the gantry to document its own history through its modular growth.